Just look at that Triple Toe Loop! What Great Form! Last Saturday evening my family, a few friends and I went on an outing. Our destination was the Naval Academy ice skating rink at Dahlgren Hall. The ice was smooth and clean, and the crowds were small, which made for a good session. We sat on wooden benches overlooking the rink, pulled on our skates and started for the ice. At first, we were a little shaky, even those of us who have been skating for years. As others whizzed by, we felt kind of helpless, but we pulled ourselves together and, each with our own rhythmic patterns, skated around turns. Some of us glided professionally while others went to the middle to practice twirls and the art of skating backwards without running into anyone. We skated, laughed and played for about an hour when we decided to take a break. We made our way to the cafeteria for snacks. After a quick warm-up of pizza and hot chocolate we returned to the ice. By this time, many people had started to leave, but not us. We stayed on the ice. Our practicing soon turned into a game of tag. Finally, at ten o'clock, the skate guards started closing up. We reluctantly left the rink, happily exhausted. As we returned our skates and piled into the car for the trip home, we all agreed it was a great way to spend a Saturday night. 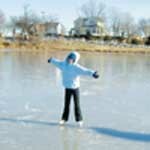 Quiet Waters: Until the Spring ThawGlide over Quiet Waters Park's ice rink. Weather dependent. 3-9pm MWThF; 10-9 SaSu & holidays @ Quiet Waters Park Ice Rink, Annapolis. $4 w/discounts; $2 skate rental: 410/222-1777. Inner Harbor Ice Rink overlooks Inner Harbor. $5 admission and $2 skate rental. Call for daily hours: 410/385-0675. Naval Academy Ice Rink at Dahlgren Hall is still holding public sessions, but call to find out when: 410/263-4527. Theres nothing quite like racing across a frozen pond, the wind hitting your cheeks as you glide free as a bird. The cold weather sometimes turns a familiar watering hole into an instant skating rink. There may be no rink guards to blow the whistle but that means taking extra responsibility yourself. 2. Always have a responsible adult check the ice before stepping on to it. Just because it looks safe doesnt mean it is. 3. Bundle up and dont stray from your group. outside your door. Don't just stand there admiring them. Go outside and collect a bowlful. Bring it into the kitchen and add some sweetened condensed milk, flavored with vanilla or maple syrup. Stir and eat it fast before someone else wants some. Sunday Jan 21 (2-5:30pm)Be the best you can be. Learn about child development, responsibilities and fun things to do with kids. Bring a pencil and a snack. Certificate will be awarded. $25 w/discounts; age 13+. YWCA, Arnold. rsvp: 410/626-7800. Sat. Jan. 27 (2-3:30pm)It's said that whistle pigs, or groundhogs, can predict weather. Can they? Find the answer to this question and more as you search for these elusive mammals. Ages 6-10. Kings Landing Park, Huntingtown. rsvp: 410/535-5327. Jan. 27 & 28 (2pm)Have fun with Arthur, everyone's favorite aardvark. Make an Arthur puppet to take home and enjoy Arthur videos on the big screen. Ages 4-6. Zany Brainy, Annapolis Harbour Center: 410/266-1447. Beginning the week of Jan. 29Kindermusik and Musikgarten classes begin for kids ages birth to 5 years to promote musical and physical development thru fun and activities in a caring way. Call for when and how. Mary M. Hoffman Music Studio, Galesville: 410/798-5181. Thursdays, Feb 1-22 (1-1:45pm)Kids have hands-on fun with computers. Quickcam and Robotics plus math, reading, art and music. Ages 3-5. $40: Northeast Comm.Center, Chesapeake Beach. rsvp: 410/257-2554.